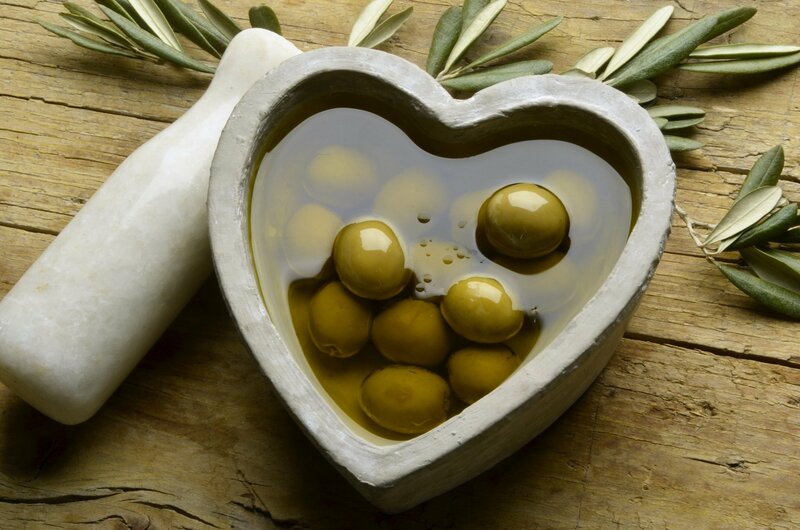 "A spoonful of olive oil a day can keep the doctor away"
Extra virgin olive oil has mono-unsaturated fats, which has been seen to decrease lipid oxidation. King Saud University in Saudi Arabia, carried out a study showing that extra virgin olive oil may protect the liver from oxidative stress. The high amount of antioxidants like polyphenols that are found in Extra Virgin olive oil may reduce Low-density lipoprotein. The journal Chemical Neuroscience published a document that discussed the possibility that oleocanthal in Extra virgin olive oil might help reduce the accumulation of beta-amyloid, which is believed to be a factor of Alzheimer’s disease. Extra virgin olive oil contains phenols, tocopherols, triolein, squalene and phytosterols. These are associated with an increased life expectancy. Many health professionals recommend Extra virgin olive oil as part of a well-balanced, healthy diet. Studies have found that the antioxidants that are in extra virgin olive oil may prevent cell destruction and also may help to protect the arteries. Hydroxytyrosol is an anti-inflammatory compound that is found in Extra virgin olive oil. Other research has found that hydroxytyrosol which is in Extra virgin olive oil possesses antimicrobial, antioxidant and antidiabetic properties. This may provide protection against heart disease and may play a role in preventing or slowing the growth of tumors. A team of scientists at the Universitat Autonoma de Barcelona in Spainfound that there might be a link to reducing the chance of breast cancer when people eat Extra virgin olive oil instead of vegetable oil. A good balanced diet and regular exercise are big parts of achieving good health and wellbeing. Adding Extra virgin olive oil can help in a positive way to achieving this. The UC DAVIS Olive Center’s research found that two tablespoons of Extra virgin olive oil a day can improve blood levels of lipids and lipoproteins. Extra virgin olive oil may play a role in the development of the central nervous system. Extra virgin olive oil contains oleocanthal that has been seen to have some anti-inflammatory properties. Extra virgin olive oil increases the production of peptides which may support healthy digestion. It is easily absorbed by the human body, which can help absorption of vitamins and polyphenols. Extra virgin olive oil contains some vitamins, such as A, D, E and K. These have been seen to help protect against free radicals and cell oxidation. A daily intake of Extra virgin olive oil may help to strengthen the immune system. Replacing saturated fat with monounsaturated fat through foods like Extra virgin olive oil, can be beneficial to our health.